The DIGITRACE 30/50/80m Service Tracer enables a complete length of drain, duct or pipe (non-metallic) to be traced when used in conjunction with any DIGICAT and the DIGITEX 8/33 or other signal generator. The DIGITRACE’s coiled fibre-glass rod, which protects the central copper tracing conductor. The fibre-glass rod is inserted and pushed along in the service under investigation. The DIGITEX 8/33 is connected, and the tracing signal is located on the surface by the DIGICAT. The DIGITRACE 30m service tracer allows tracing of plastic ducts, clay drains and other non-metallic conduits. DIGITRACE is used together with any DIGICAT and DIGITEX 8/33 signal Generator. 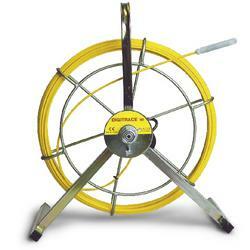 The DIGITRACE 50m service tracer allows tracing of plastic ducts, clay drains and other non-metallic conduits. DIGITRACE is used together with any DIGICAT and DIGITEX 8/33 signal Generator. The DIGITRACE 80m service tracer allows tracing of plastic ducts, clay drains and other non-metallic conduits. DIGITRACE is used together with any DIGICAT and DIGITEX 8/33 signal Generator.